Chef shares her holiday recipes, including mac cheese pie, fried turkey and bread pudding with pecans. Growing up while her cousins played in the back yard, Tasha Roberts cooked in the kitchen with her mother and grandmothers. Now she’s a professional chef and graduate of Tidewater Community College’s Culinary Arts program. Roberts worked in plenty of restaurants as a host, server and manager. That experience finally gave her the motivation to try culinary school. Roberts looked into several for-profit schools before selecting TCC’s program, which is accredited by the American Culinary Federation. She enrolled in 2012 and spent the next three years studying for her Associate of Applied Science in Culinary Arts, which she earned in 2015. She completed her bachelor’s in business from Old Dominion University in 2017. Roberts recalls being totally unprepared for culinary school, even though she came to that first class with a swagger. 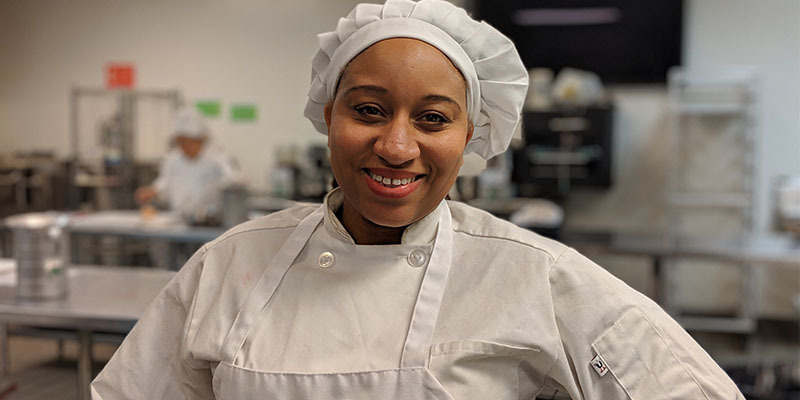 Roberts’ favorite class was “Garde Manger” under chef Deanna Freridge because of the difficult recipes and the various sauces she learned to prepare. She also enjoyed the end-of-semester banquet where students showcased their special dishes. Roberts completed her externship hours in the Norfolk Student Center Café. After graduation, she worked as a chef at Founders Inn. She later served as executive chef at Jewish Community Center in Virginia Beach. Today, Roberts owns and operates Bonjou, a catering, private chef and pop-up food kiosk featuring her speciality, Cajun-Creole food. She serves up healthy portions of Southern favorites from gumbo to jambalaya to shrimp boils and more. 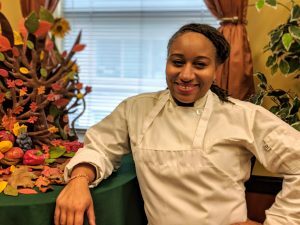 She also works under chef Jacoby Ponder in the Norfolk Kitchen Lab. Roberts’ favorite time of year is Thanksgiving. She shares some of her prized recipes below. Over low heat, combine all of the marinade ingredients (roasted garlic, white pepper, cayenne pepper, butter, beer, hot sauce) in a 2-quart sauté pan. Simmer just enough to melt the butter and dissolve the seasonings. Cool. Refrigerate and allow the turkey to marinade for 4 -6 hours or even overnight. In a 30-quart (tall not squat) stock pot and a propane burner, with a good regulator, bring the peanut oil to 325F. Use the stainless steel basket to hold the turkey OR use only 100 percent cotton twine to tie the legs of the turkey and lower the turkey VERY slowly into the oil. Ensure that the oil does not bubble over the sides of the pot. If it does, remove the turkey immediately and turn off the burner before a grease fire erupts. Preheat oven to 400 degrees. Grease a 9-inch deep dish pie plate. In a medium-sized bowl, combine 1½ cups cheese and macaroni; sprinkle into pie plate. Place remaining ingredients minus remaining ¼ cup cheese in a blender jar. Blend until smooth, about 15 seconds on high speed (or 1 minute in a large bowl with a hand mixer). Pour into pie plate. Bake about 40 minutes, or until a knife inserted in center comes out clean. Sprinkle with remaining ¼ cup cheese. Bake an additional 1 to 2 minutes, until cheese is melted. Cool 10 minutes then cut into wedges. In a large, heavy pot, combine potatoes, sugar, water, orange juice, vanilla, orange zest, cinnamon and salt. Bring to a simmer over high heat. Lower heat, cover and simmer, stirring occasionally, until potatoes are tender, about 20 minutes. Strain the potatoes out of the sauce and place in a casserole dish. Return the sauce to the pan. Add the rum to the sauce and continue to cook until syrup is thickened, about 15 minutes. Pour the syrup over the potatoes. Add the pieces of butter and the marshmallows (as many as you like). Place in the oven. Bake until the marshmallows are browned, about 10-15 minutes. Remove from the heat and serve immediately. Prepare an 8×8 or 9×9 baking dish by lining it with parchment paper and spraying well with a nonstick cooking spray. Place all of the bread pieces into the baking dish. Pour the melted butter over the bread. In a large bowl, whisk together the eggs, corn syrup, brown sugar, granulated sugar, maple or vanilla extract, cinnamon and salt. Stir in pecans. Pour evenly over the bread pieces. Use a rubber spatula to push and “prod” the bread pieces around in the dish until all are coated in the syrupy mixture. Bake at 375 degrees for 45 minutes. Serve warm with a dollop of whipped cream!